Rootstock. - Thick, charged with a crimson juice. Scape. - Naked, one-flowered. Leaves. - Rounded, deeply-lobed. Flower. - White, terminal. Calyx. - Of two sepals falling early. Corolla. - Of eight to twelve snow-white petals. Stamens. - About twenty-four. Pistil. - One, short. 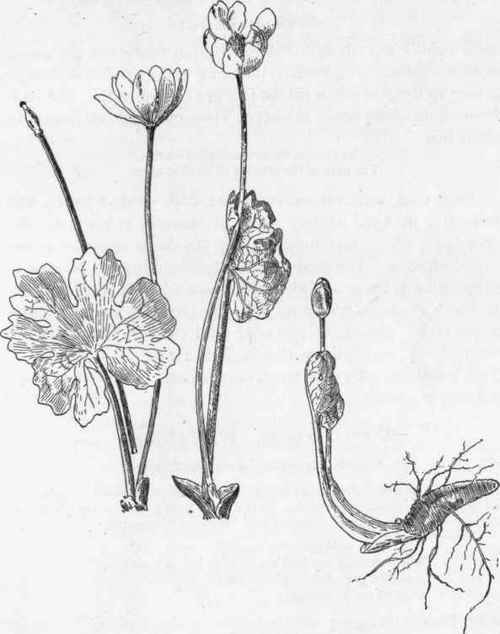 In early April the firm tip of the curled-up leaf of the blood-root pushes through the earth and brown leaves, bearing within its carefully shielded burden - the young erect flower-bud. When the perils of the way are passed and a safe height is reached this pale, deeply lobed leaf resigns its precious charge and gradually unfolds itself; meanwhile the bud slowly swells into a blossom. Surely no flower of all the year can vie with this in spotless beauty. Its very transitoriness enhances its charm. The snowy petals fall from about their golden centre before one has had time to grow satiated with their perfection. Unless the rocky hillsides and wood-borders are jealously watched it may escape us altogether. One or two warm sunny days will hasten it to maturity, and a few more hours of wind and storm shatter its loveliness. Care should be taken in picking the flower - if it must be picked - as the red liquid which oozes blood-like from the wounded stem makes a lasting stain. This crimson juice was prized by the Indians for decorating their faces and tomahawks.